When you are creating complex visualizations, you might find it challenging to keep track of all of the graphic objects on the canvas. The smaller items might be hidden under the larger ones and thus working with them could get difficult. Layers can help you to keep track of your items. Think of the layers as transparent planes, each containing graphic items that are glued together. If you change the order of the layers, you also change the position (visibility) of the items on the canvas. You can move items within a single layer, or you can group together multiple items spread throughout several layers. If you copy objects, then a new object is copied into the layer of the original object. Layers can be controlled from two different places. There is a Layer window located above the properties window (toggle its visibility in the main menu – section Windows), and there is a Layer Combo Item located on the GUI Toolbar. With the Layer Combo option, you can control all aspects of Layers. An explanation of the controls is in the following picture. The Layer window is activated in the main menu. Go to Window and toggle Layer Window visibility on/off. 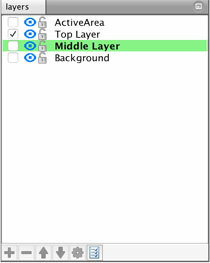 To change the layer’s visibility, click on the eye icon of the corresponding layer. You can lock a selection for a given layer by clicking on the Lock icon. If the layer is locked, you will not be able to select any of its elements. The Active layer is the one into which new objects are drawn. 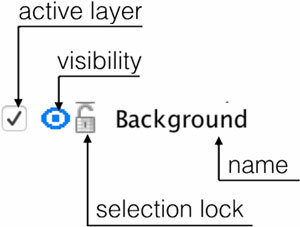 For example, if you set the active layer to a layer named “Background” and then create a new object, this object will be created in the layer called Background. The Active layer cannot be locked, as you cannot create new elements on locked layers. 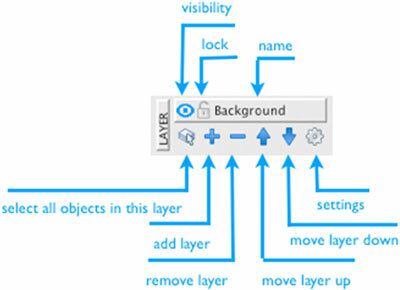 If there is no object selected in your view, the name of the active layer is displayed in the Layer combo control. 2. Click on the Layer Combo control, and list of layers is shown. 3. Click on a layer name, which you want to set as the new Active Layer. The Active layer is denoted in the Layer Window by the checked checkbox on the left side of the layer control. 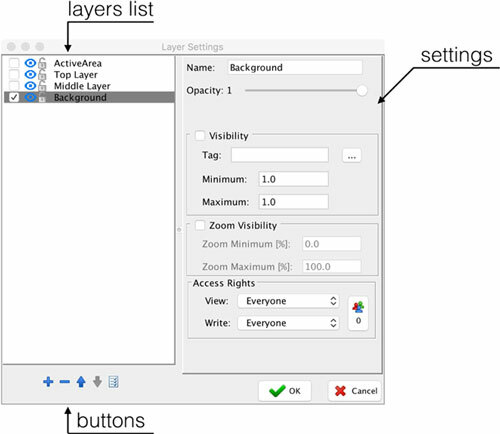 To select a new active layer, simply check the checkbox next to the desired layer. To create a new layer, press the “+” button. A new dialog appears; enter the Layer name and confirm. A new layer will be created. If you continue, the layer will be deleted along with all the graphical objects it contains. WARNING: If you delete a layer, all graphical objects contained in the layer will be removed as well. This action cannot be undone. To select all items in given layer, click on the select all items icon. To change a layer name, double click on the layer name. The Rename dialog will be shown. Change the name and press the OK button. As you might notice, the topmost layer is always a layer named “ActiveArea”. This Layer cannot be removed or shifted. It only contains active areas defined in your views. Active areas are always on top of the rest of your drawings. If you select an object or multiple objects, the layer containing these objects will be displayed in the Layer Combo box and highlighted in green in the layer list.
. 1 The selected object is on the layer named “Middle Layer”. You can see the name of the layer in the Layer Combo control panel. 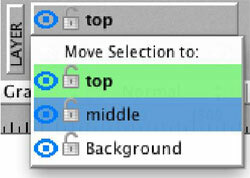 Note that the name is in bold.
. 2 The selected object is on the layer with the name “Middle Layer.” This is shown in the Layer Window by a green highlight and bold font. If you select multiple objects belonging to different Layers, the Layer controls will highlight all corresponding layers in green. Note: The Layer Combo box will show the name of the top layer in the selection; its name will not be in bold. If you want to move objects to a different layer, select the objects on the canvas and then select the desired layer. The selected objects are all moved to the desired layer. 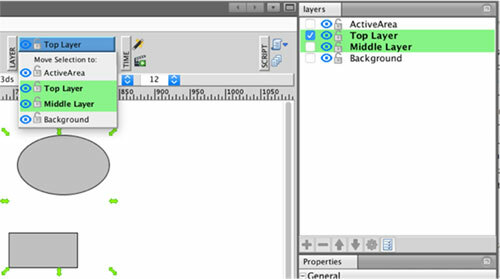 A green highlight shows which layer contains your selected objects. To move the selection to a different layer, just click on the layer name. Changing the order of Layers is quite simple. Just select a layer you want to move and then click on the Up or Down arrow to move it. Layers at the top of the list overlap the layers at the bottom of the list. Therefore, if you move a layer up, it will overlap all the layers below it in the list. To change layer properties, press the setting button. You will be presented with the Layer Settings dialog. 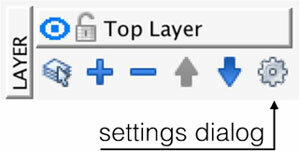 The layer settings dialog has two parts; on the left side, there is a list of layers. You can add, delete, change position, and merge layers with the buttons at the bottom of the list. 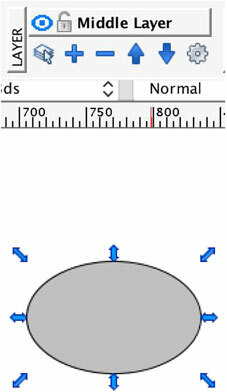 On the right side, there is a settings pane for the selected layer. 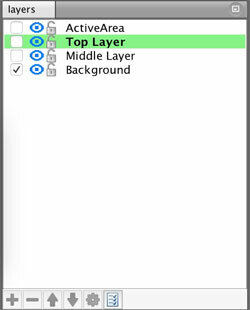 To change a layer’s name, click on the layer in the list of layers to select it. Then you can write a new name in the Name box. To change a layer’s opacity, click on the layer in the list of layers to select it. Then drag the Opacity slider to change it to a new value. 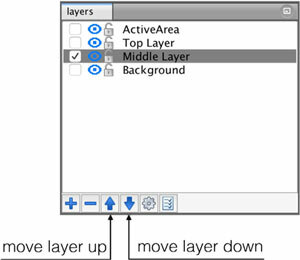 To change a layer’s visibility, click on the layer in the list of layers to select it. Then, fill in the conditions for visibility. E.g., enter tag and minimum and maximum values. If the tag value is within the range of the specified minimum and maximum values, the layer will be visible. 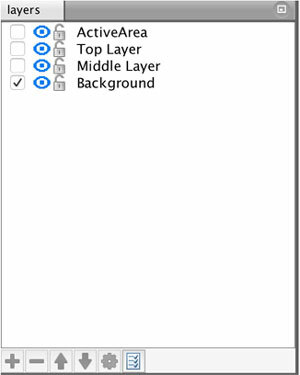 To change a layer’s zoom visibility, click on the layer in the list of layers to select it. Then check the zoom visibility check box. Now you can specify the minimum and maximum zoom level when the layer will be visible. For more information about zoom visibility animation, please refer to the chapter Animations. You can limit who can view the objects in a given layer. In addition, you can limit which users will have access rights for objects in given layer. 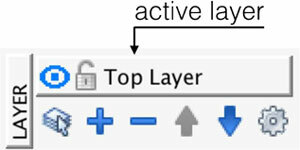 To change a layer’s access rights, click on the layer in the list of layers to select it. Then you can change the access levels for read and write access as well as access group levels. For more info about User Access Rights, please refer to the chapter User Accesses.